Many car-hire facilities in Europe will only quote prices in Euros or British pounds sterling. You will get a very limited choice if you select USD as a currency, so it is best to select Euros (or Sterling). Your car hire cost will simply be paid for in Euros, just like any other purchases you make while staying in the Euro zone. Compare offers from a range of suppliers, including Hertz, Auto-Europe, Argus and more. The range of suppliers searched will depend on the location, and the currency chosen. The hire-car finder search box above will search through the offers of a range of, including low-cost operators and some major brands, and offer you the best online rates for a choice of solutions, from the cheapest to the most expensive. Hiring a car in France is as easy as doing so in any other country. Low-cost car hire facilities as well as the big names in car hire are available at all airports, all main rail stations, and at many other locations within towns and cities. Are low-cost car-hire companies reliable ? Yes, otherwise they would not stay in business ! Mostly, they are in fact car hire agents (like travel agents, only just for car hire), who find and negotiate the cheapest rates possible with the companies who actually provide the rental cars. For example, if you choose a car from Rentalcars or Argus you may well pick up your vehicle from one of the well-known car hire companies such as ; Alamo, Hertz , Europcar, Avis etc.... only at a discounted rate not available to people booking directly. And the others work in the same way. ► Select your hire point from the drop-down list in the search box below. ► Place cursor in date box, and use the calendar that opens up. NB: low-cost car hire operators do usually allow for pick up and drop-off at different locations within France if this is what you are looking for. Do not use this box if you want to pick up a rental car in France and return it in another country. Use one of the big international operators.such as Hertz or Europcar. Click for tips on where best to hire a car in Paris. To hire a car in France you must be at least 21 years old; some car-hire firms will not hire vehicles to drivers under 25. You must hold a valid drivers license from your country of origin, and you must have held this licence for a year or more. You will need to show this license when picking up your vehicle. Drivers from other European Union countries and some other countries do not need an International driving licence. However they may need to show a passport or national identity card. Visitors from Asia, Australia, Africa, and many parts of the Americas (including some US states) must also have an International Driving License. This is true whether hiring a rental car or driving a vehicle that is put at your disposal under any other circumstances, i.e. lent by friend or family, company car, or long-term leasing. It is advisable to check with your local driving organisation, tour operator, or the local French embassy if you are in any doubt as to whether you need this document. An international driving license is a document you will need to obtain in your own country, before coming to France. 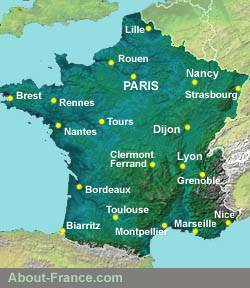 About-France.com is not a car hire company; the role of this web page is to allow travellers to compare cheap car hire options offered by a number of companies and/or brokers, and to book their vehicle on line using the services of the companies concerned. By using this form, you will leave About-France.com, and be taken to Eurocarhire.com, part of Carhireengine.co.uk, the largest specialist car hire affiliate network in the UK., founded in 2008. Carhireengine contracts with major car-hire firms and reputable low-cost car-hire operators throughout France and worldwide. These include hire-car providers such as Hertz, Avis, Alamo, Sixt, Thrifty, and brokers including Auto-Europe, HolidayAutos, Argus, and others. By using this service, you will have a wide choice of cheap car hire options from several different companies, often including unbeatable rates. The choice of suppliers for any given enquiry depends on location and currency. Any booking contract made through this site is a contract between you, the user, and the car hire company selected. Under no circumstances can About-France.com be considered as party to or guarantor of any contract entered into by users of this website. Travellers are reminded that it is unusual for car hire companies to guarantee a specific model of car; in virtually all cases, advanced bookings will guarantee a specific type of car (compact, economy, limousine, etc. ), but not a specific model. This is true even with the largest operators, except when specific terms of the vehicle rental contract guarantee a particular make of vehicle and/or model. For information on travel in Spain, visit Driving in Spain on About-Spain net.